The 2017 Joint Air Power Competence Centre (JAPCC) Air and Space Power Conference was held between 10 and 12 October in Messe Essen, Germany. The Conference boasted 300 participants including senior military leaders, NATO staff, non-governmental organizations, defence industry officials and staff from 27 different nations, all of whom contributed to the discussion on this complex and challenging area. The theme was deterrence and the role joint air power plays – and should play – in providing NATO with an effective deterrent posture. In introducing the Conference, it was highlighted that the theme of ‘deterrence’ had featured very heavily in the JAPCC’s previous two air power Conferences. During the 2015 Conference on ‘Air Power and Strategic Communications’, the criticality of sending clear, concise and easily-understood messages about NATO’s joint air capabilities was highlighted as one the critical ingredients of an effective deterrent posture. Similarly, in 2016 the Conference topic of ‘Preparing NATO for Joint Air Operations in a Degraded Environment’ led to discussion which concluded that there was an urgent need to refocus the training of NATO forces in order both to develop their warfighting skills in degraded environments, and, equally importantly, to be visibly prepared to fight – and win – in such conditions. Again, the associated issue of sending a powerful signal of credible deterrence was central to this debate. Given this backdrop, it was highly appropriate that the 2017 JAPCC Conference be dedicated to the role of air power in delivering an effective NATO deterrence. Following a review of the diverse, unpredictable and demanding security challenges in today’s contemporary geostrategic environment, the Conference moved on to consider the political dimension of cohesion and decision-making in deterrence theory, before considering NATO’s current air power capabilities. The Conference concluded with an analysis of NATO’s current joint air power capabilities and heard from a distinguished panel of experts on the results of a recent study, commissioned by NATO’s Allied Command Transformation, which highlighted urgent short-term priority areas for improvements to NATO’s air capabilities. 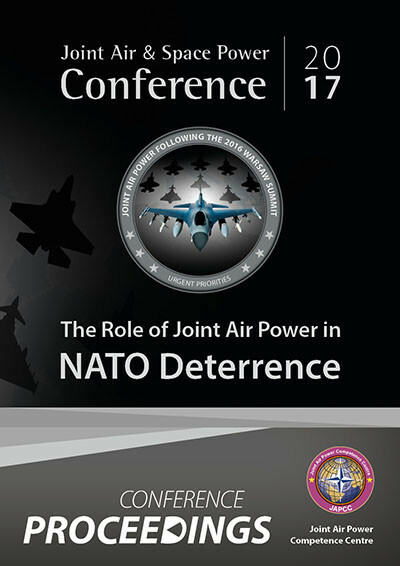 In seeking to address the broad-ranging issue of ‘The Role of Air Power in NATO Deterrence’, the JAPCC’s intention was for the Conference to act as a catalyst to stimulate debate amongst senior military staff, academics and industry partners in order to provide NATO’s strategic leadership with innovative ideas on potential actions required in this area. The following Proceedings consolidate significant points from the keynote addresses, the panel discussions and attendee contributions to form a summary reference of the event and to highlight areas for future consideration and development. The document does not record the minutes of the Conference; rather, it highlights the major themes and draws together thoughts and ideas from all elements of the Conference. For a fuller understanding of the topic, readers are encouraged to read these Proceedings in conjunction with the previously published Conference Read Ahead material.